The Canon LEGRIA HF M31 camcorder is based on the LEGRIA HF-21 and uses a 6.35mm CMOS sensor to record Full HD video using AVCHD with 15x optical zoom. The new feature for the HF M31 is the switch to touchscreen controls on the 2.7 inch/68.6mm LCD screen. 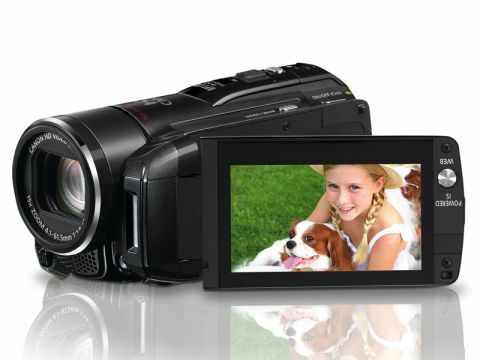 The HF M31 has a single button for the Powered IS (Image Stabilisation) feature. This adds an extra level of image stabilisation over and above the amount you get with the Standard or Dynamic settings and comes in handy when using the zoom. The set-up menus have been created to make the most of the touchscreen controls. You navigate using a swiping motion with your finger. As you scroll past each item, it is highlighted and you can then tap it to see the available options. It sounds reasonable in principle, but doesn't work too well in practice. There are six hardware control buttons, a switch to toggle between Auto and Manual modes and a hardware zoom rocker control. There are five data rates on offer for video that range from 5Mbps to 24Mbps, but these only cover two resolution settings of 1440x1080 and 1920x1080. The HF M31 comes with an impressive 32GB of built-in memory, along with an SD/SDHC card slot. It also includes a Component cable with a proprietary connector and an AV-out cable with a mini jack on one end and RCA/Composite at the other. It does not include a Mini HDMI cable, which is poor considering the price. Canon includes a copy of Image Mixer 3 SE Ver.6 transfer utility and video tools on CD to handle your AVCHD movies. Video quality is fine, although it drops off in low light conditions. The Canon LEGRIA HF M31 is more than twice the price of Samsung HMX-H200 or Toshiba Camileo SX900, but not twice as good.